Why you shouldn’t bet the farm on anything I say. In this post I made my squirrely predictions re: who would win NBCC awards, having read, well, basically none of them. The only winner I guessed correctly was in the Biography category, for Sarah Bakewell's bio of Montaigne. To be honest, that was a total shot in the dark, based on the fact I wanted to read the book. Strangely, that doesn't pull much weight with the NBCC. A bit rude, if you ask me. Now that I know the winners, it's time to read them. Not all of them, but at least these: the winner for fiction – Jennifer Egan's A Visit From the Goon Squad, the winner for autobiography – Half a Life by Darin Strauss, the winner for nonfiction – The Warmth of Other Suns: The Epic Story of America's Great Migration by Isabel Wilkerson, and the winner for biography – How to Live: A Biography of Montaigne… by Sarah Bakewell (eBook, using my Kindle app). I regret I couldn't read all the books on the shortlist, before the winners were announced. That's beyond my ability to fit into my life right now. When any major award's shortlist comes out I itch to read all the books. I did that, selectively, with the Bookers a couple years ago, and want to with the upcoming Orange Award nomination list that will be popping up very soon. 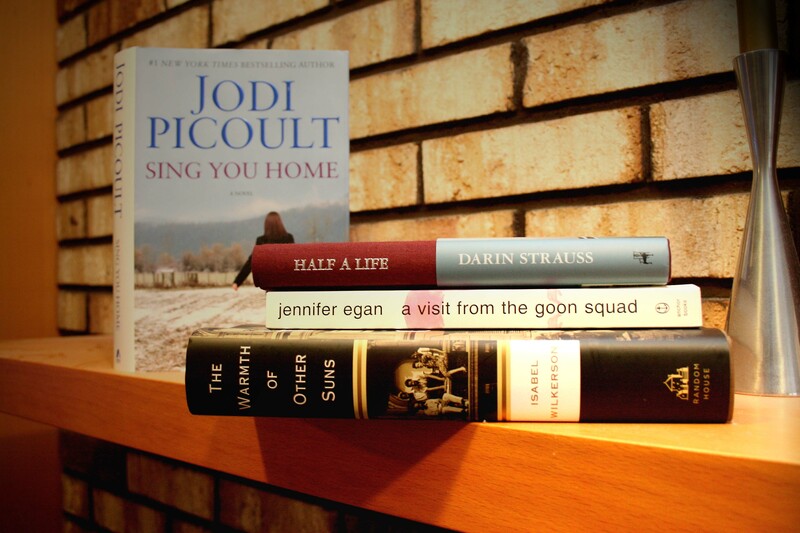 And why, you may ask, is Jodi Picoult's Sing You Home sitting behind the NBCC winners? Because she tweeted that reader reviews on Amazon have been mean-spirited, and asked that anyone who enjoyed the book post a review. I replied that I would, and she was grateful. I've started the book and will post when I finish. I won't give a positive review if I don't end up enjoying it, but I will review it fairly, without attacking the author, saying she's lost her talent, etc., as some already have. It's so pompous to declare a writer has lost his or her talent, such a sweeping statement to make about something no one can know. Rude, too. Even the best authors occasionally publish a clunker. Look at Updike's Terrorist. Ugh. Total stinker. Would anyone dare say he'd lost his talent because one book stunk? Doubtful. So why should that be the case with Picoult? I'm no expert on her novels. I read one – The Tenth Circle. And I enjoyed it. It had flaws, but it entertained. It was for review; I probably wouldn't have picked it up otherwise. I don't recall anything about it now, such is the nature of so much general fiction. It's read for entertainment, not for staying power. But would I attack her for her style? Not at all. Fairness requires you examine the good and the bad, what measures up and what doesn't. I hope I'm able to help her a bit. Today I'm going to get my reviewing house in order, prioritizing what I have ongoing and posting more about current books/reviews in process in what I hope will be tomorrow's Sunday Salon. Things are out of hand right now. I have so many books in the queue, way more than I put on the sidebar. Some are eGalleys, too, and I'm going to sync my iPhone to NetGalley this morning, so I don't have to lug around a computer to read these. That's a real pain. Busy, busy. In a good way, but busy nonetheless. Hope you're all having a lovely reading week. I know I am!